BrokenLease.com not only offers people the ability to easily find a suitable place to rent whether an apartment, town home, condominium, house or other rental property but also to provide valuable information and resources to renters. When renting any property from a private landlord or management company, it means your credit history and rental history will be a huge factor in the decision of whether or not you will be approved for the apartment or other rental property you applied for. Potential landlords will pull your credit report to review your credit history to see if the report shows good credit or bad credit. For those individuals who have good credit, more than likely will be approved for the apartment or rental property they want while those who have bad credit, may have a hard time to get approved for their chosen apartment. To potential landlords, credit score and credit history is important when making a decision to rent an apartment or other property or not. Unfortunately for renters who have unsatisfactory credit history, poor credit score and/or rental history, it can affect the approval process for a place to rent. BrokenLease.com has the tools in place to assist potential renters locate the place they wish to rent regardless of what is showing up on their credit report. When you are looking for your next apartment you might need help. Set short term goals. Begin to work on your credit. Begin to improve your job, your pay, or your business. And take some time to take care of you. As you begin to re-build your credit and your life, you might be surprised at the number of people who are here to help you. We are here to help you find an apartment, a broken lease apartment, an apartment for you near you even with bad credit, and an apartment you can call home again. Stay in a good place and don’t use this experience as a way of taking you down. It’s important to keep a positive mindset as you are changing your life. Plan on making new choices for your next apartment so you can prevent evictions, bad credit and losing your place. When you make a new plan, you can live this plan and make changes in your outcomes. Bad credit is when you have a signed agreement that involves paying borrowed money back like a mortgage for a home, a car loan, loans, credit cards and more. A signed agreement is also give when renting an apartment, furniture or anything else. Also, unpaid utilities, cable bills and cellphones can show up on credit reports. When you have a signed agreement or have a service agreement, you are expected to make payments by the set due date. When payments are received after the due date, it will more than likely show as delinquent on your credit report. Every month a payment is past due, it can reflect on the credit report. If credit obligations are paid on time, then that means you have good credit and when they are not paid on time, you may very well have bad credit. Bad credit can affect your life tremendously. Lenders of loans and credit cards may not want to give you a loan or credit card if your credit history has late payments on it or anything else showing on the credit report like a foreclosure, repossession, liens or anything else. A lender may decide to decline your application or inflate your interest charge, giving you higher monthly payments. Did you know that bad credit can also possibly affect your vehicle insurance rate and whether or not you would be required to pay a security deposit for your new cellphone service? Also, if a potential landlord decides to rent you an apartment, they may require more of a security deposit like first and/or last months’ rent on top of the first month’s rent. If you missed any payments on credit cards, loans or other payments, you probably already know you may have bad credit. If recently, you have had a credit application turned down, credit limits on credit cards lowered or interest rates have increased, it is sign your credit may not be in the best shape. You can improve your credit over time. To get started, request a credit report so you can see what is on your credit report. You want to check the items on the report and make sure everything on the credit report is yours. If you know you paid something in full and it is still showing you owe money, then you can contact the creditor and hopefully get it closed. Also, you can file a credit report dispute and hopefully get items off your report that may be impacting the credit score. Most importantly, start paying your debt on time. Lenders will see you had a bad time in your life in the past but now you are back on track. If you are able to open up a credit card with a small limit to start building your credit back, it can help too! A low credit score does mean bad credit, while a high credit score indicates good credit. At any time, a creditor lends money to an individual with bad credit, the creditor faces a greater risk of the individual missing payments, which means the person is considered a higher risk. So, if the lender decides to lend you any money or approve you for credit, they may approve you with a higher interest rate, which can be upsetting! No matter what, you don’t have to deal with bad credit for long, you can make changes to start repairing it. BrokenLease.com consists of experienced apartment finders, apartment locators and apartment and residential rental professionals help individuals find a place to rent at no cost for the service. We will help you find a place to rent regardless if you have bad credit. Unfortunately, life does happen and sometimes things happen affecting your credit. The process of searching for an apartment and getting approved by a landlord can be stressful, especially if you have bad credit. We have been working with numerous individuals just like you who have bad credit. So, you are definitely not alone. 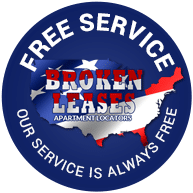 BrokenLease.com services are absolutely free. We will help you locate your most ideal apartment, and it won’t cost you anything. To get started, just fill out the form, submit it as soon as you can and one of our professional apartment locators will get back in touch with you with a list of fantastic apartments that meet your requirements. We will end up saving you a lot of time and aggravation. You can sit back and relax while we get a list of suitable places for you to rent regardless if you have bad credit or not. What are you waiting for? Let’s get started. It won’t take you very long to see why BrokenLease.com will be your #1 source for landing a great apartment. How Long Does Bad Rental History Stay on Your Record? The good news is that a bad rental history is not a life sentence. Once you begin to re-build your credit and pay your rent on time again, the past can be repaired. We can help with finding an apartment that doesn’t check rental history, just fill out our form and we can get started looking for you in many cities around the United States of America. Within a short time once you have begun renting again, the eviction or broken lease apartment history will start to fade. Once you get into good standing again with a new landlord, the past can become less important. Now don’t forget to start your credit repair at the same time. Within 10 years you can have fresh high credit and the eviction will be a thing of the past. One thing you can do as you begin to get back on your feet is to look at your credit history and have any false or incorrect information removed. Working on repairing your credit is a good first step after experiencing bad credit or not being able to find an apartment due to an eviction or bad credit. Here are some tried and true examples of getting bad credit back into good while you are apartment finding for homes that let you move in even with bad credit or apartments that have no credit check. It’s still a good idea to start edging upwards with your credit score. Make small payments each and every month on time. Even if you can’t pay off a whole credit debt, making small monthly payments will put you in the right direction. Look at your credit report at least every few weeks and write dispute letters if any of the information is incorrect. Don’t give up on yourself. You maybe had a broken lease or you were evicted from your apartment. We can find an apartment even with bad credit or an eviction but you should start taking steps in the right direction (don’t give up). Start with small credit accounts again and don’t owe more than 50 percent on any of them. Don’t max out any credit cards. Have more credit available than you use. A small payment is better than no payment. If you have old debt that has been sitting around for a long time, you might be able to have an organization argue to pay a lower amount than the amount owed to clear the debt. Remember even a library book overdue can lead to a credit mark and collection. Keep an eye on your credit and monitor all of the actions. You may not even realize that you have old credit bills on your report if you don’t look at it. Open your mail. Once you start having a lot of mail from creditors, it can be hard to open your mail. Open your mail, you might be surprised. Something good might happen. Or, at least, you can know when to call and fight something inaccurate. The bottom line is that you can get a handle on your credit, and this will help you with apartment-finding. We can find an apartment near you that accepts bad credit, in many cases, but it’s also great to show your credit score changing upwards. If you have four or five months of evidence of change to the higher credit score number, this can be used to vie for your success.